This year’s Cannes Yachting Festival will host the exciting World Premiere of the exceptional Trident 620 flybridge sports motoryacht from Outer Reef Yachts. Marking the first in a series of European built Trident Series boats from Outer Reef, the 61’ 8” / 18.8m long T-620 was developed in cooperation with Setzer Yacht Architects and is based upon a revolutionary and patented Tri-brid™ vacuum infused hull. With sporty good looks and a sharp-suited appearance, the T-620 is bound to attract style-conscious buyers from Europe and beyond and is a perfect solution for those wanting to enjoy day-cruising, long weekend getaways, with a further option for extended, long-range cruising. A plumb bow design with a forgiving, wave-piercing forefoot that elevates when horsepower is applied from semi-displacement speeds. The rationale behind the Tri-brid™ hull is about empowering owners who like to cruise as fuel-efficiently as possible, but who might still enjoy short and thrilling bursts of speed up to 28 knots on occasion. Displacing 28.58 tons at half-load and powered by an ultra-efficient, twin 550hp Cummins engine package, the T-620 is built to CE Category A Unlimited Ocean classification and is a true, long-distance ocean-voyager with economical fuel consumption of just 3.9 US gallons/hour at 8 knots giving a safe cruising range of 1500nm. A walk-around main deck/pilot house leads aft to a shaded, external seating area. Steps lead down to the swim platform which has an ingenious Hi-Low boarding system built-in, designed and constructed exclusively by Outer Reef engineers. This fully automated system has a detachable handrail and is an improvement upon standard passerelles, by enabling safe stern-to boarding across a range of quay-side/dock-side heights. The system also doubles as a submerged ladder for the safe boarding of swimmers or divers. Up above the pilot house/salon there’s a spacious flybridge, with either single or twin helm seat set-up, a table, and plenty of outside seating and space for everyone to socialize. Towards the back there’s a dedicated tender cradle and hydraulic crane for convenient launch and retrieval. Customers can choose between one of three different interior décor styles that include a choice of different wood veneers and one of six Awlgrip hull colors. Accessed by guests through the central hall area, the T-620’s en-suite accommodation comprises a full-beam owner’s stateroom, with 6’ 8” standing head-room and a fully flat (not stepped) floor. A forward located VIP suite, provides another highly comfortable and welcome retreat for another 2 people and there is the option of either an additional twin bunk-bed style cabin, or the same space can be requested as an office/study, with a single Pullman berth if required. 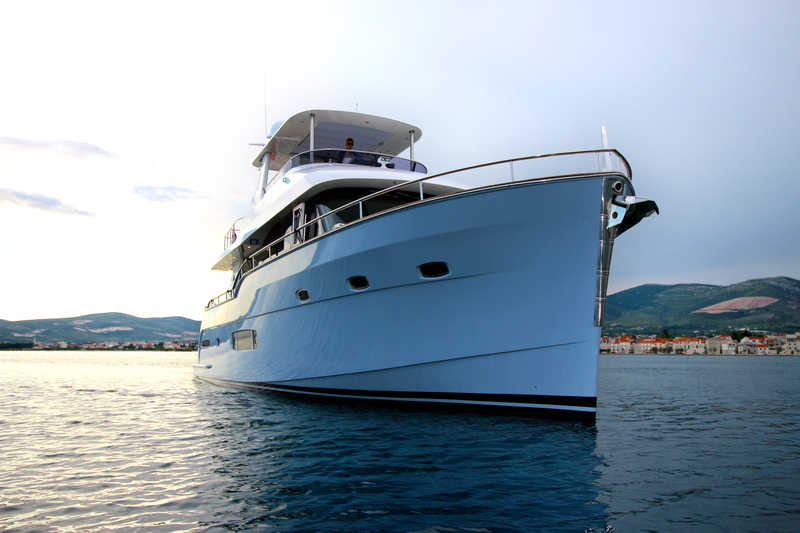 Taking account of the fact that some owners may wish to opt for a small crew, the T-620 has the option for an additional one or two crew berths, within the workshop/storage area, in front of the separate engine room. There are three interior versions including two galley aft layouts, which flow more directly onto the aft deck area and appropriate for owners who entertain regularly or prefer an indoor-outdoor lifestyle. Whereas the galley forward layout follows a more traditional route, feels comfortable and works well for live-a-boards or those who prefer to cruise greater distances at a time. Carefully considered touches such as offering full-depth drawers in our staterooms offer users the kind of storage space not always available on competitor yachts in this size range. Similarly, high-quality, branded fittings, for example, such as Corian countertops and Grohe galley and head fixtures add that truly luxurious feel throughout. An exceptionally quiet boat for occupants inside; flexible seals and rubber insulation minimize the risk of vibration, while pipe work and trunking has been isolated on mounts with sound-proof foam to minimize internal noise, such as the sound of water slapping against the hull. 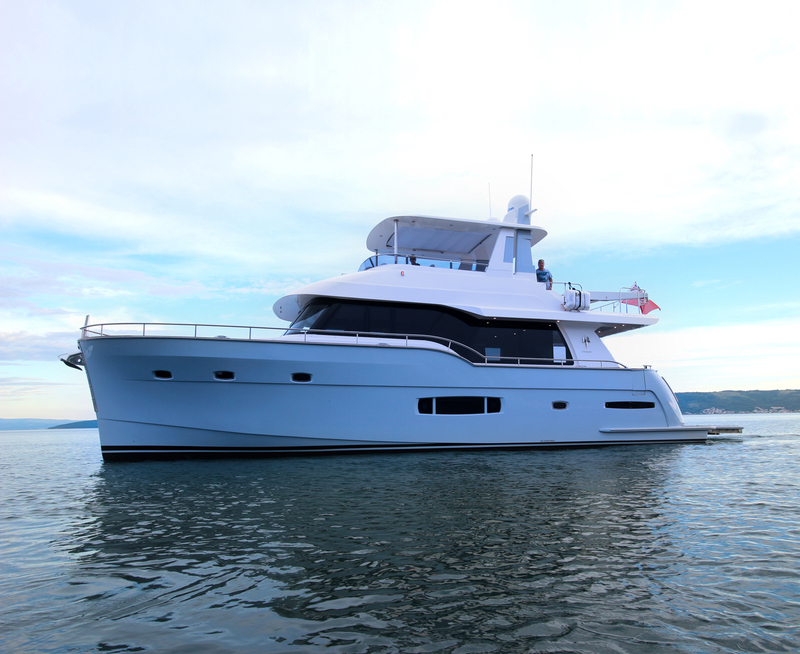 Discover more about the Outer Reef Yachts Trident T-620 at this year’s Cannes Yachting Festival.